The robot development environment ArmarX aims at providing an infrastructure for developing a customized robot framework that allows to realize distributed robot software components. To this end the ArmarX framework comprises distributed communication functionality supporting a wide range of programming languages such as Python, C++, C# or Java. Further start-up and error handling, mechanisms for state implementations, interface definitions and concepts for the structured development of robot programs are available. 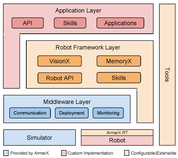 In addition to this core functionality, ArmarX provides customizable building blocks for high level robot control which can be used to build a generic backbone of the robot’s software architecture. 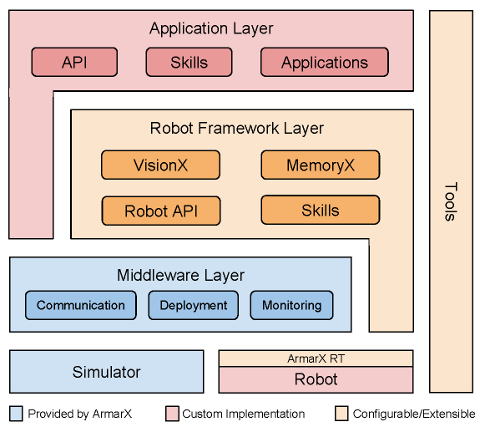 ArmarX provides standard interfaces and ready-to-use implementations of several core components which are needed to setup a distributed robot software framework.